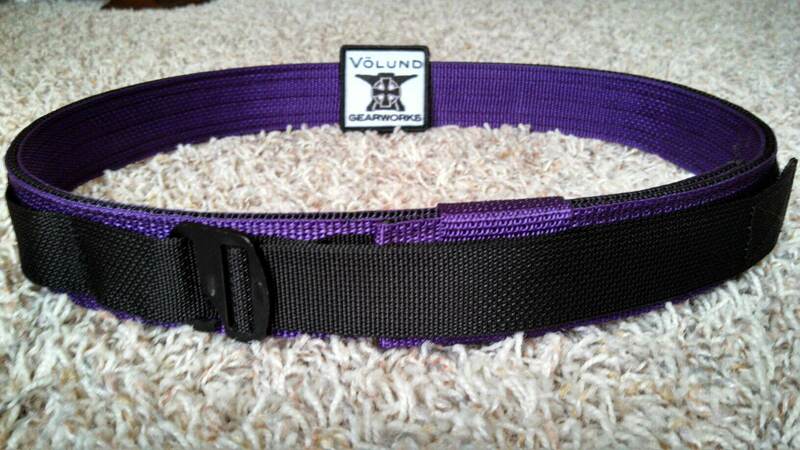 I had the pleasure of having two first impressions with the Volund Gearworks ATLAS Belt. First: When my husband got two ATLAS belts, loved them and had me wear one during a defensive shooting class. 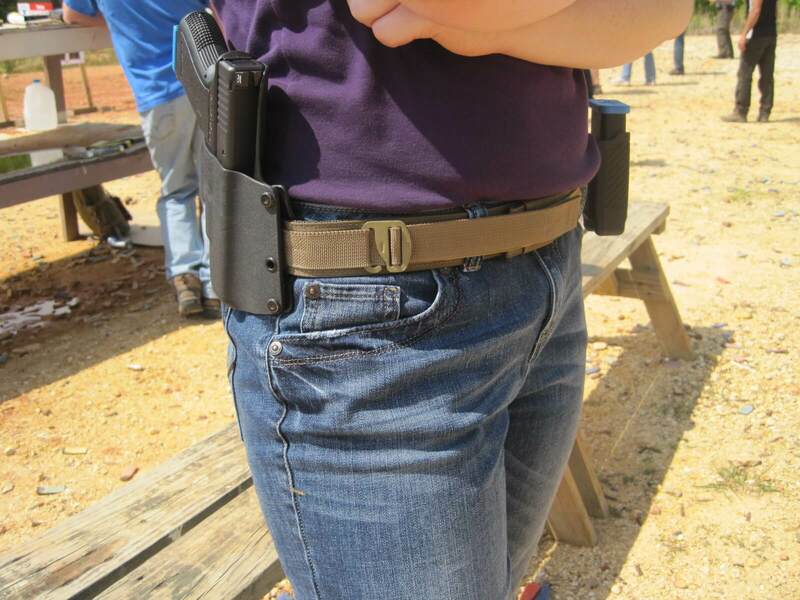 I wore the ATLAS Belt during a Combat Focus Shooting defensive handgun course. I had the belt on a total of 17 hours that day and at the end of the day, the belt was still comfortable on. I was a little hesitant at first thinking it would be too stiff and dig into my hips. It was my first time wearing a dedicated firearm belt, holster and magazine pouch. I was pleasantly surprised at how comfortable it was. It was stiff and a little heavy at first, but I quickly forgot I was wearing the gear. During a full day of training and drawing from a kydex holster over and over, the belt didn’t move. I didn’t have to adjust the ATLAS belt or my pants at all during the class. Through all the running, bending, sitting, and crouching down, I didn’t have to pull up my jeans. Which is a huge plus for me. Many of the men at the class were constantly pulling up their pants or having difficultly drawing from their holsters because their belts weren’t secure. Since I didn’t have that issue, I was able to focus on the instruction given in class, without this distraction. I was very happy with my first experience with the ATLAS belt. It made me want my own ATLAS belt as I wanted to use it every time I go to the range. My husband spoke with the owner of Volund Gearworks (Matt Gibson) and ordered me a custom belt. Second: Was when MY ATLAS belt came in the mail. Mine of course is way better than my husbands. Mine is purple and black. 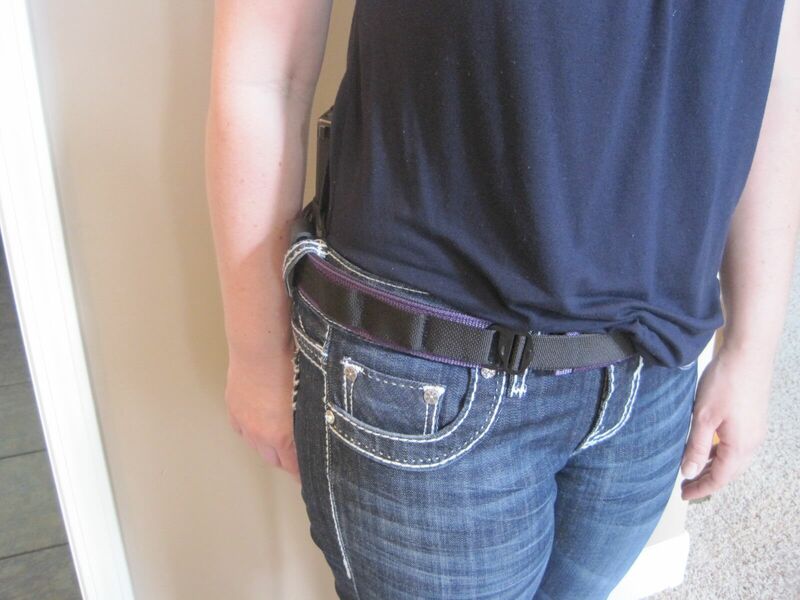 The wonderful thing about a purple gun belt is, I know my husband won’t be wearing it. It is truly my very own piece of gun equipment. This is my first gun related item that is only mine. I am 5′ 4”, 135 lbs. I wear a size 5 jeans or a 28/30 depending on the brand. I ordered a size Medium ATLAS belt 32-38. I did this on purpose so that I can wear the belt with an inside the waist band (IWB) holster or an outside the waist band (OWB) holster. I have about 5 inches of overlap with no holster on. With the IWB holster I had 3 inches of overlap. The overlap for me doesn’t add any additional bulk or imprint. I prefer to have that extra overlap in case I want to wear more gear or my weight changes. The ATLAS is easy to put on and tighten down. The belt fit easily through the loops on all my jeans. The G-Hook buckle is quick to hook onto the loop and easy to remove, but stays secure and doesn’t move unless you manipulate it. I was unfamiliar with the G-Hook and the manipulation of it the day on the range. That first time I wore it, I found myself tightening the belt instead of loosening the belt when I needed to take it off. With some instruction from my husband, I was able to quickly correct my issue. Now I have no problem with the manipulations of the belt. I’ve been wearing the ATLAS belt with my jeans, capris and even some skirts. 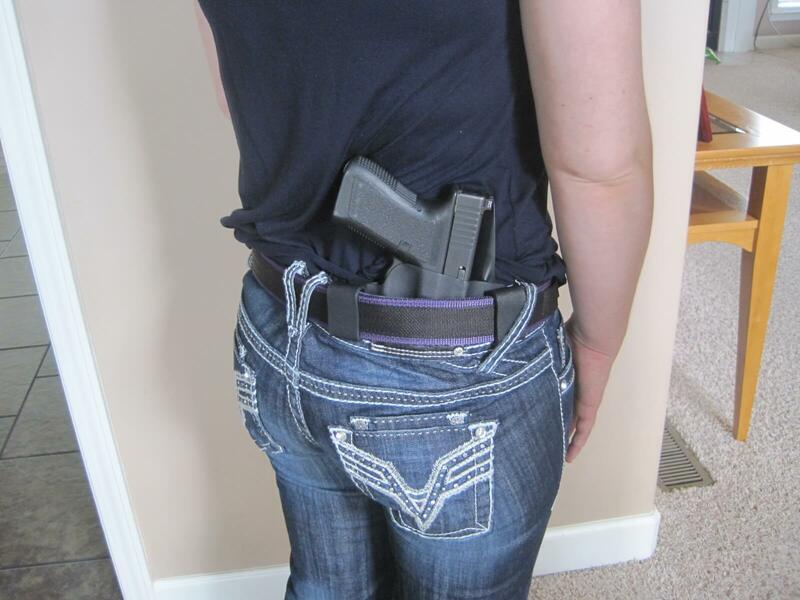 I’ve noticed, during my normal daily routine, I don’t have to pull up my pants or adjust my holster. I didn’t normally wear a belt before receiving the ATLAS, unless it’s a fashion belt that you are supposed to see with my shirt tucked in. So, it has been a little bit of an adjustment to get used to. I have been pleasantly surprised with how comfortable it is. I have used it with a Glock 19 IWB Kydex holster, a OWB Kydex holster and even with no holster. Both holsters have stayed secure with the Atlas and I’ve had no need for adjustments during the day. The IWB Kydex holster I have been using, isn’t the best fit for me, it’s my husband’s old holster. I was still able to easily conceal with this holster. 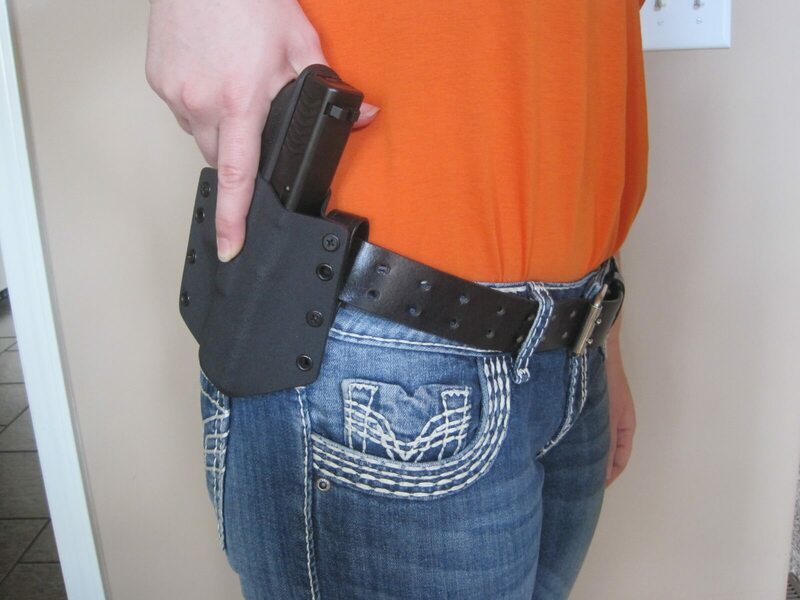 There are nicer and more comfortable designed kydex holsters on the market now. With the ATLAS belt it kept everything in place. I even ran a block with it on and had no movement. The ATLAS belt provides a secure stable platform for drawing a firearm from IWB or OWB carry while concealing. The ATLAS belt secures the holster comfortably along side of my body, allowing me to conceal very well. There is very little printing of the firearm and I have been using a Glock 19. With a regular leather belt on the gun didn’t sit closely to my body. The holster moved freely from side to side and up and down. Pulling the gun out of the holster I had a good 2 inches of the holster coming up with the gun. I had movement of the holster even with simple walking around. I didn’t feel comfortable and I didn’t feel the gun was secure. I have learned that it is very important to have the right equipment. Without the correct equipment I can’t conceal easily, or comfortably carry for an extended period of time. I am very happy with my ATLAS Belt. It is very comfortable, most of the time I forget I have it on. I have had no problems with it. 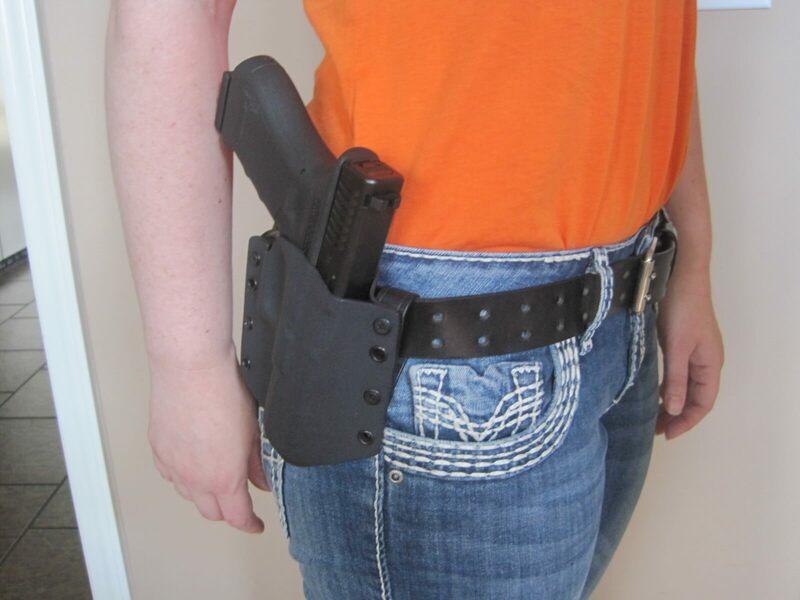 I can conceal easily and wear a gun for an extended period of time with an ATLAS belt on. I recommend it to any woman who needs a gun belt. The Volund Gearworks Atlas belt will be my every day conceal carry gun belt. Who makes the iwb kydex holster in the first picture at the range? The company that make that holster (NTAC) is no longer is in business. It is an ok holster and even if it was still made, we would strongly point you in the direction of Dark Star Gear. We have a link to DSG on the top right side of our page and several members of the Loose Rounds staff have DSG holsters. Check out some of our Dark Star Gear reviews. Also several of the Volund Gearworks reviews had the DSG holsters in them. Cassie, I am so thankful to have found your posts. I’m a mom of two, used to purse carry until the first was born, but got scared that lack of sleep/mama brain would cause me to be careless with it, so haven’t carried in years. Some horrible things in the local news lately have made me realize that I need to be ready to protect myself and my children, so I’m looking to find a way to carry on my body at all times and take some classes. My husband got me a fobus paddle holster to carry his ruger p89, but the dang thing is huge and while we can open carry in my state, I feel like it’s a bad move. Plus even with an old webbed belt of his cinched super tight, it’s still sagging and moving around while I walk! I’m leaning towards getting an Atlas belt based on your review, a Glock 43, and an iwb holster to appendix carry. Just hope my weak hands can chamber it (it was a lot easier to chamber his p89 than the little kel tec he let me try). Anyway I was scared I’d have to switch to high waisted mom jeans to keep a gun secure until I saw all of your great tips. Thanks so much! !